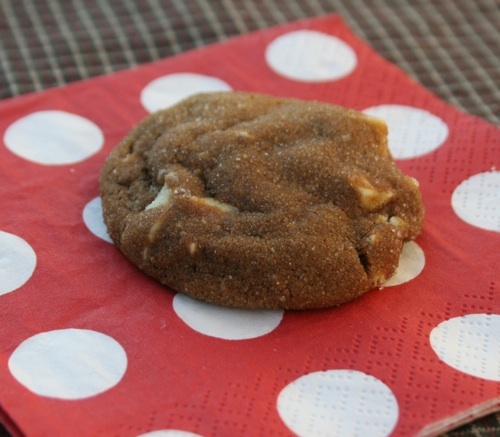 cardigans and kids: a recipe for chewy white chocolate gingerbread cookies. a recipe for chewy white chocolate gingerbread cookies. Back in the day, oh, maybe 11 years ago, when we lived near a "Bagel and Bagel", they had the most amazing gingerbread cookie with white chocolate. I remember going to Hen House (which was across the parking lot from Bagel and Bagel) just so I might have a couple of minutes to run in and purchase one of those cookies wrapped in saran wrap. I would eat part of the cookie on the ride home, the rest I would wrap back up and save for later. Since then I have experimented with different gingersnap cookies. This one is the favorite and reminds me of the ones from Bagel and Bagel. Chewy on the inside, but still a bit crunch to the outside, and the white chocolate puts them over the top yum! 1. Line 2 baking sheets with parchments paper. In a medium bowl, sift together flour, ginger, cinnamon, cloves, nutmeg, and cocoa. 2. In the bowl of an electric mixer, beat the butter for a couple of minutes. Add brown sugar, beat until combined (2 more minutes). Pour in the molasses, beat until combined. 3. In a small bowl, dissolve the baking soda in the boiling water. 4. Beat in half of the flour mixture into the butter mixture. Add the baking soda mixture, beat until combined. Add the remaining flour mixture and beat again. Add the white chocolate chunks. 5. Turn dough out onto a piece of plastic wrap. Pat dough out into a 1-2 inch roll, seal with the wrap. Refrigerate for at least 2 hours, until firm. 6. Heat oven to 325 F. Pour the remaining 1/4 c. sugar into a small bowl. Roll dough into 1 1/2 in. balls, roll in the sugar. Place 2 in. apart on parchment covered baking sheet. Bake for 10-12 minutes. Let cool 5 minutes; transfer to a wire rack to cool completely. Just as a side note: you may notice there are no eggs in these cookies. It's not a typo - I've made them twice in the last two days - no eggs in these. THESE WERE AMAZING, thank you so much!! I'm so glad you liked them-especially since you had not eaten lunch! !